Keep the brightest and the best in play with these LED strobes and warning lights. From simple flashing lights to LED messaging, these safety lights help keep workers aware and safe. Safety signs forewarn workers of dangerous conditions before they step into a situation they may not be prepared for. 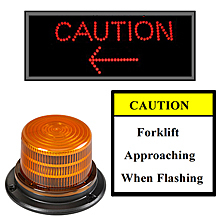 Add the printed word to safety lights to communicate effectively in your facility. Add photoluminescence for lights-out evacuation. Every time a forklift or other industrial vehicle at your facility causes injury there is a domino effect that costs your company money.